Supraspinatus tendinopathy is a common and disabling condition that becomes more prevalent after middle age and is a common cause of pain in the shoulder. A predisposing factor is resistive overuse. The supraspinatus tendon of the rotator cuff is involved and affected tendons of the musculoskeletal system and becomes degenerated, most often as a result of repetitive stresses and overloading during sports or occupational activities. The tendon of the supraspinatus commonly impinges under the acromion as it passes between the acromion and the humeral head. This mechanism is multifactorial (see below). The supraspinatus muscle is of the greatest practical importance in the rotator cuff, derives its innervation from the suprascapular nerve and stabilises the schoulder, exorotates and helps abduct (lift up sideways) the arm, by initiating the abduction of the humerus on the scapula. 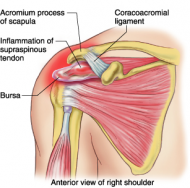 Any friction between the tendon and the acromion is normally reduced by the subacromial bursa. The anterior margin of the supraspinatus is defined by the posterior edge of the rotator interval that separates the supraspinatus from the rolled superior border of the subscapularis. The posterior margin of the supraspinatus is marked by the extension of the raphe between supraspinatus and infraspinatus around the scapular spine. The anterior portion of the supraspinatus is composed of a long and thick tendinous component whereas the posterior portion has been shown to be short and thin. An anatomic dissection study of the supraspinatus footprint found that the mean anterior to posterior dimension of the supraspinatus tendon was 25 mm, with a mean medial to lateral thickness of the footprint of 12 mm - the mean distance from the cartilage to the supraspinatus footprint was 1.5 mm at mid tendon. The supraspinatus and infraspinatus tendons fuse 1.5 cm proximal to their insertions. Collagen is the major matrix protein of supraspinatus tendons, consisting of > 95% type I collagen, with lesser amounts of other collagens including collagen type III. The anatomy of the supraspinatus’s insertion is of key relevance in terms of its extracellular matrix composition and has been categorised into four transition zones. The first zone is proper tendon, made up of largely type I collagen and small amounts of decorin. The second zone is fibrocartilage and consists of largely types II and III collagen, with small amounts of types I, IX and X collagen. The third zone is mineralised fibrocartilage and consists of type II collagen, with significant amounts of type X collagen and aggrecan. The fourth zone is bone and is largely type I collagen with a high mineral content. This effective bone-tendon attachment is achieved through a functional grading in mineral content and collagen fibre orientation. The supraspinatus enthesis is a highly specialised in homogeneous structure that is subjected to both tensile and compressive forces. The mean age of onset of this complication is in the sixth decade (age 50 to 59), and it is more frequent in diabetic patients. It is also a common cause of shoulder pain in athletes whose sports involve throwing and overhead motions. Patients present with progressive subdeltoid aching that is aggravated by abduction, elevation, or sustained overhead activity. They feel also tenderness and a burning sensation in their shoulder. The pain may radiate to the lateral upper arm or may be located in the top and front of the shoulder. It typically becomes worse with overhead activity. Initially, the pain is felt during activities only, but eventually may occur at rest. Pain is felt after frequent repetitive activity at, or above shoulder. Patient feels weakness of resisted abduction and forward flexion, especially with pushing and overhead movements. Patient has difficulty sleeping at night due to pain, especially when lying on the affected shoulder, and with an inability to sleep. 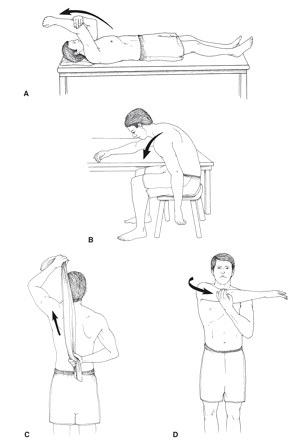 Patient has difficulties with simple movements, such as brushing hair, putting on a shirt or jacket, or reaching the arm above shoulder height. Patient has a limited range of motion in the shoulder. Patient had a former shoulder trauma. 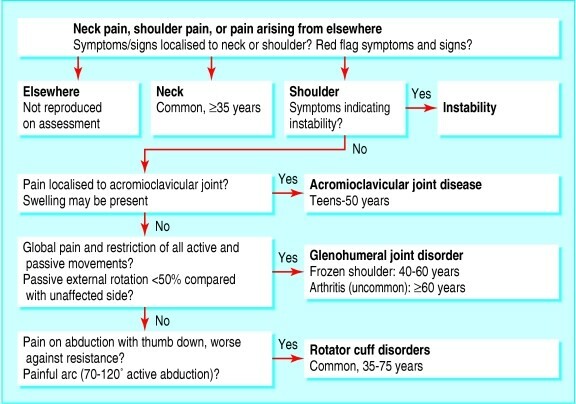 The shoulder may be warm and there may be fullness anterolaterally. Further, there is a painful arc between 70° and 120° of abduction. So supraspinatus tendinopathy is usually consistent with anterior instability causing posterior tightness. The problems that patient with Supraspinatus Tendinopathy complain off, are pain, inflammation, decreased ROM, strength, and functional activity. blood for white cell counts, search for abnormal blood biochemistry and inflammatory markers, as well as radionuclide imaging and MRI. Diagnosis is usually clinical, but imaging can be useful. Shoulder x-rays can reveal calcifications in rotator cuff tendons and in the bursa. In longstanding cases, there may be degenerative changes, such as cystic/sclerotic changes at the greater tuberosity and decreased humeral head-acromion distance, secondary to upward migration of the humeral head. In acute calcific tendinopathy, calcifications may be irregular, fluffy and ill-defined. Dynamic ultrasound can demonstrate thickening of the subacromial bursa and impingement during abduction. Magnetic resonance imaging (MRI), rather than computed tomography (CT), is the preferred modality, since it produces more detailed soft-tissue images. The anamnesis often reveals that, in case of a calcification, due to a trauma, pain emerges later on, after a few hours. The physical examination consist of taking the fever, looking for external wounds or bruises over the affected shoulder and checking the skin temperature. Further, the examinator will palpate in the area of the tendinous insertion of the supraspinatus muscle for checking tenderness and pain. Both passive and active movements will be performed. Specific questionnaires can be used: Simple Shoulder Test (SST), Oxford Shoulder Score (OSS). If sonografy is done, the standard method for sonographic evaluation of the supraspinatus tendon requires the arm behind the back (Crass position) or hand on the back pocket (modified Crass position). Crass et al described scanning the shoulder in extension and internal rotation, achieved by placing the patient’s hand behind the back. Yet diagnosis is usually clinical, but imaging can be useful. 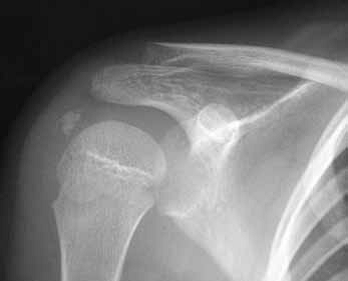 Shoulder x-rays can reveal calcifications in rotator cuff tendons and in the bursa. In longstanding cases, there may be degenerative changes, such as cystic/sclerotic changes at the greater tuberosity and decreased humeral head-acromion distance, secondary to upward migration of the humeral head (6). In acute calcific tendinopathy, calcifications may be irregular, fluffy and ill-defined. Dynamic ultrasound can demonstrate thickening of the subacromial bursa and impingement during abduction. Also sonografy and Magnetic resonance imaging (MRI) can be done. The treatment used to manage a supraspinatus tendinopathy depends on the etiology of the pathology. At first a conservative treatment is preferred. This treatment involves physical therapy, nonsteroidal anti-inflammatory drugs (NSAIDs), ice treatments and resting. Corticoid injections can also be used additional to physical therapy. A surgical intervention can be a solution if there is no improvement after 3-6 months of conservative treatment. NSAIDs may be the first choice for mild to moderate symptoms, if there are no contraindications to these agents. A short term use (7-14 days) of NSAIDs is useful to relieve the pain associated with a tendinitis. However, there is little evidence supporting a long term course of NSAIDs. Moderate to severe symptoms may require a local subacromial corticosteroid injection. For more information about corticosteroid injections. The major indications for surgery are ongoing pain, loss of function, failure to respond to conservative therapy for 3 months or evidence of an acute tear in a younger patient. Surgical approaches include calcium deposit resection, with or without subacromial decompression, bursal resectionA and acromioplastyB, using either arthroscopic or open methods. It’s also possible to split off the coraco-acromial ligament to enlarge the space between acromion and humerus. This can cause instability, but we can compensate it with some training of the rotator cuff. With physical therapy it takes patients up to 4 months to recover. The goal of a surgery is to obtain pain relief, increased range of motion and increased power. ABursal resection: Removement of the subacromial bursa. Acromioplasty: Generally, it implies removal of a small piece of the surface of the acromion that is in contact with a tendon causing, by friction, damage to the latter tissue. The main goal in the acute phase (initial phase) is to alleviate pain, inflammation, prevent aggravation of pain, reduce muscle wasting and normalize the arthrokinematics of the shoulder girdle. A period of rest should be considered in order to avoid further aggravation and shoulder discomfort. Passive modalities should be considered in order to avoid painful aggravation. Modalities such as ultrasound, cryotherapy and electrical muscle stimulation can provide temperory relief in acute phase. Strengthening exercises such as isometric exercises should be considered in order to work out the shoulder girdle musculatures. Proper home exercise programs should also be taught in conjuction with proper ergonomics. The management of a supraspinatus tendinopathy consists of different progressive exercises. There are three phases of treatment: Immobilization, passive/assisted range of motion, progressive resistance exercises (Level of Evidence: 5). Early management includes avoidance of repetitive movements that aggravate the pain. Patients should be informed about pain provoking postures and movements. Cryotherapy, soft tissue techniques and wearing a sling/taping are some other techniques to relieve pain (Level of Evidence 5). Gentle range-of-motion exercises, such as Codman’s classic pendulum exercises, maintain range of motion and prevent development of adhesive capsulitis(Level of Evidence: 3A) (Level of Evidence: 3A). Once pain has been reduced, joint mobilisations, massages, muscle stretches, active-assisted and active exercises are needed to improve the ROM again. Active-assisted mobilisations can be done by the patient himself/herself by using an exercise bar. We can also use a rope and pulley, this way the unaffected arm is able to pull the affected one into anteversion (Level of Evidence 5). Strengthening exercises should work on the external rotators, internal rotators, biceps, deltoid, and scapular stabilizers(Level of Evidence: 2B). Strengthening these muscles will keep the shoulder joint more stable and prevent further injuries. Eccentric exercises will also be more effective than concentric exercises (Level of Evidence 1A). Joint mobilization may be included with inferior, anterior, and posterior glides in the scapular plane(Level of Evidence: 3A). Stretching exercises should be done by repeating the exercise 3 times and holding the stretch each time for 30 seconds. Neuromuscular control exercises also may be initiated(Level of Evidence: 3A). PNF patterns will increase strength in rotator cuff muscles and increase the stability of the shoulder. We can use four different patterns. Modalities that also may be used as an adjunct include cryotherapy, hyperthermia(Level of Evidence: 1B), transcutaneous electrical nerve stimulation and ultrasound. Intensive ultrasound therapy has been shown to increase calcium resorption, but this requires frequent treatment that may not always be practical(Level of Evidence 1B). Patient's starting position: sitting, arm abducted to a position before symptoms appear, contact with three finger tips of the left hand in the supraspinous fossa (a). Movement: pressure into the supraspinous fossa, active adduction of the right glenohumeral joint, then releasing the pressure into the supraspinous fossa, and back to the starting position (b). Patients suffering from non-calicfying supraspinatus tendinopathy may benefit from low energy extracorporeal shock wave therapy, at least in short-term(Level of Evidence: 1B). At the end of the therapy you should initiate plyometric and sports-specific exercises. Patient education is again reemphasised, maintaining proper mechanics, strength, and flexibility, and having a good understanding of the pathology. The patient should also show an understanding of a home exercise program with the proper warm-up and strengthening techniques (Level of Evidence: 3A) (Level of Evidence: 2B). Supraspinatus tendinopathy is a common source of shoulder pain in athletes that participate in overhead sports (handball, volleyball, tennis, baseball). This tendinopathy is in most cases caused by an impingement of the supraspinatus tendon on the acromion as it passes between the acromion and the humeral head. Pain, and a decrease in range of motion, strength and functionality are the main complaints that accompany this injury and should be addressed in the physical therapy. There is enough evidence to prove that physical applications such as ultrasound , cryotherapy, hyperthermia, transcutaneous electrical nerve stimulation and extracorporeal shock wave therapy have a beneficial effect on the recovery of supraspinatus tendinopathy. But we have to remember that it is very important to use these methods as an adjunct to physical therapy (increasing ROM, strength training of the rotator cuff muscles and other shoulder stabilizers). ↑ Chard M.D., Sattelle L.M., Hazlerman B.L. (1988). The long-term outcome of rotator cuff tendinitis – a review study. Br. J. Rheumatol 1988, 27:385-389. 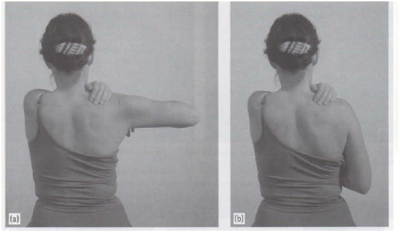 ↑ Fu F.H., Harner C.D., Klein A.H. (1991), Shoulder impingement syndrome: a critical review. Clin. Orthop.;269:162-73. ↑ Sommerich C.M., McGlothlin J.D., Marras W.S. (1993), Occupational risk factors associated with soft tissue disorders of the shoulder: a review of recent investigations in the literature, Ergonomics 36:697-717. ↑ 10.0 10.1 Ellis, H., Mahadevan V. (2010). Clinical anatomy – Applied anatomy for students and junior doctors (twelfth edition). Oxford: Wiley-Blackwell. ↑ 11.0 11.1 Salata M.J., Nho S. J., Chahal J., Van Thiel G., Ghodadra N., Dwyer T., Romeo A.A. (2013). Arthroscopic anatomy of the subdeltoid space. Orthopedic Reviews, volume 5:e25, 111-116. ↑ Ruotolo C., Fow J.E., Nottage W.M. (2004) The supraspinatus footprint: an anatomic study of the supraspinatus insertion. Arthroscopy, 20:246-9. ↑ 13.0 13.1 Dean B.J.F., Franklin S.L., Carr A.J. (2012). A systematic review of the histological and molecular changes in rotator cuff disease. BJR, vol. 1, No. 7. ↑ Riley G.P., Harral R.L., Constant C.R., Chard M.D., Cawston T.E., Hazleman B.L. (1994), Tendon degeneration and chronic shoulder pain: changes in the collagen compostion of the human rotator cuff tendons in rotator cuff tendinitis. Ann. Rheum. Dis., 53:359-66. ↑ Ruud A. B, Johan M. T., Geja O., Brian L.H., Graham P.R. (1999), Lysylhydroxylation and non-reducible crosslinking of human supraspinatus tendon collagen: changes with age in chronic rotator cuff tendinitis, Ann. Rheum. Dis., 58:35-41. ↑ Thomopoulos S., Genin G.M., Galatz L.M. (2010), The development and morphogenesis of the tendon-to-bone insertion: what development can teach us about healing. J Musculoskelet. Neuronal. Interact., 10:35-45. ↑ Amiel D., Kleiner J.B., Biochemistry of tendon and ligament (1988). In: Nimni M.E., ed. Collagen. Biotechnology. Vol III. Boca Raton, Florida: CRC Press, 223-51. ↑ Fong, C.M. (2011). Calcific tendonitis of the supraspinatus tendon in a 7-year old boy: diagnostic challenges. Hong Kong Medical Journal, 17, 414-416. ↑ Stoller, D.W., Tirman, P., Bredella, M.A., et al. (2004). Diagnostic imaging orthopaedics. 1st edn., Utah:AMIRSYS. ↑ Hawkins, R.J., Hobeika, P.E. (1983). Impingement syndrome in the athletic shoulder. Clinical Journal of Sports Medicine, 2, 391–405. ↑ 24.0 24.1 Farley, T.E., Neumann, C.H., Steinbach, L.S., et al. (1992). Full-thickness tears of the rotator cuff of the shoulder: diagnosis with MR imaging. American Journal of Roentgenololy,158, 347–351. ↑ Middleton, W.D. (1992). Ultrasonography of the shoulder. Radiologic Clinics of North America, 30, 927–940. ↑ Crass, J.R,, Craig, E.V, Feinberg, S.B. (1987). The hyperextended internal rotation view in rotator cuff ultrasonography. Journal of Clinical Ultrasound, 15, 416–420. ↑ Fong, C.M. (2011). Calcific tendonitis of the supraspinatus tendon in a 7-year old boy: diagnostic challenges. [Photo]. Hong Kong Medical Journal, 17, 414-416. ↑ 32.0 32.1 32.2 Zlatkin, M.B., Iannotti, J.P., Roberts, M.C., et al. (1989). Rotator cuff tears: diagnostic performance of MR imaging. Radiology, 172, 223–229. ↑ Neuman, C.H., Holt, R.G., Steinbach, L.S., et al. (1992). MR imaging of the shoulder: appearance of the supraspinatus tendon in asymptomatic volunteers. American Journal of Roentgenology,158,1281–1287. ↑ 34.0 34.1 Kneeland, B.J., Middleton, W.D., Carrera, G.F., et al. (1987). MR imaging of the shoulder: diagnosis of rotator cuff tears. American Journal of Roentgenology,149, 333–337. ↑ Louise Hasan, Aleisha Hill, Claire Maconochie. Supraspinatus tendinopathy. 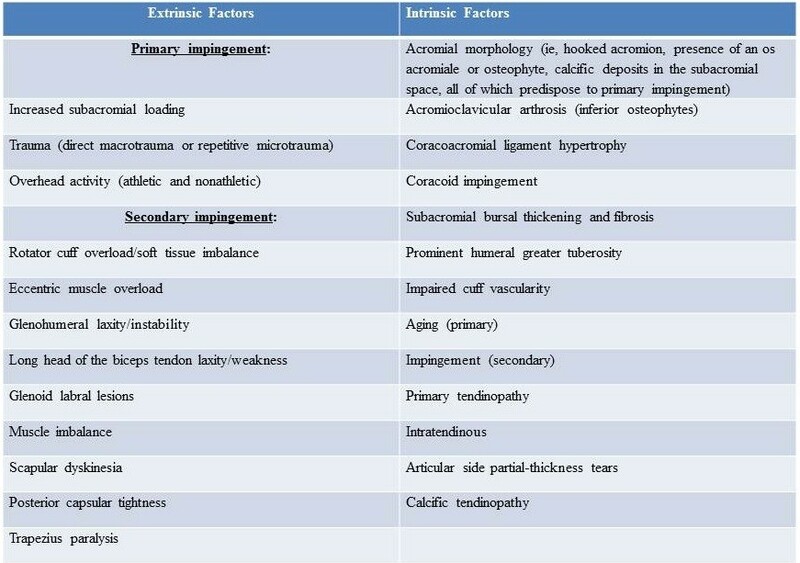 Site: http://supraspinatustendinopathy.synthasite.com/references.php (consulted on April 14, 2014). ↑ Medscape: Thomas M DeBerardino, MD; Chief Editor: Sherwin SW Ho, MD (Updated: 2013) Supraspinatus Tendonitis Treatment & Management.